The circuit shows one way of obtaining a voltage of 90V from a 1.5V battery supply. The LT1073 switching regulator from Linear Technology (www.linear-tech.com) operates in boost mode and can work with an input voltage as low as 1.0 V. The switching transistor, which is hidden behind connections SW1 and SW2, briefly takes one end of choke L1 to ground. A magnetic field builds up in the choke, which collapses when the transistor stops conducting: this produces a current in diode D1 which charges C3. The diode cascade comprising D1, D2, D3, C2, C3 and C4 multiplies the output voltage of the regulator by four, the pumping of C2 causing the voltage developed across C4 via C3, D2 and D3 to rise. Finally, the regulator control loop is closed via the potential divider (10 MΩ and 24 kΩ). These resistors should be 1 % tolerance metal film types. With the given component values, fast diodes with a reverse voltage of 200 V (for example type MUR120 from On Semiconductor www.onsemi.com) and a choke such as the Coilcraft DO1608C-154 (www.coilcraft.com) an output voltage of 90 V will be obtained. 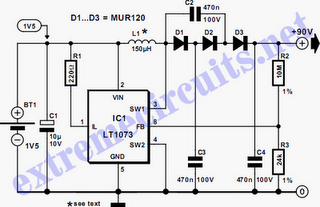 The output of the circuit can deliver a few milliamps of current.